For the next two months I am going to be sharing a lot of no-fuss, simple (and delicious!) recipes for you all. For the rest August I am going to be super busy getting ready for almost a full month of travel and in September I will be, well, traveling. My blog has always and will always be a reflection of my life, so when I don’t have time to cook, that means you will be getting a lot of simple recipes that are great for when you’re in a hurry! This week I prepared 5 Minute Paleo Plantains. 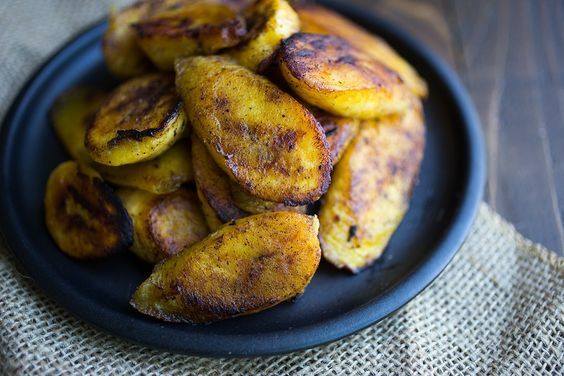 Although plantains may seem like an intimidating or fancy ingredient, they’re not! They are one of the easiest things to prepared and make a phenomenal side for my Slow Cooker Pulled Pork. I love to make this as a side along with my Bacon Lovers Spicy Southern Greens and Homemade Cole Slaw! Peel and slice the plantains to create ½ inch slices on the diagonal. Heat a cast iron skillet over medium heat and add 1 tablespoon of ghee. Add half of the plantains into the pan and sprinkle half of the allspice and salt on top. Flip after about 2-3 minutes or when the bottoms begin to brown. Cook the remaining side and remove from pan. Add remaining tablespoon of ghee and cook the second batch. Want to be sure you don’t miss a recipe or post? Sign up for my newsletter here!